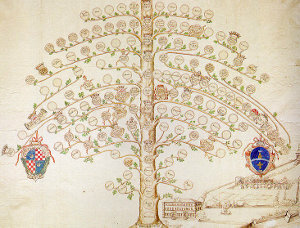 If you search your ancestors in Alberona, Puglia, info about your Italian family are stored in the City Office archives or at the parishes. In towns and villages of Puglia and in Foggia province registry offices were established in early 1800: it means that you could find information in Alberona registrar as of that date. So, if your ancestors were in Alberona in the nineteenth or twentieth century, then you could try to contact the City Office of Alberona to know more. Before to start your genealogy research in Alberona, we suggest you to read our tips for your search . They are useful to search in Puglia and in Alberona too. 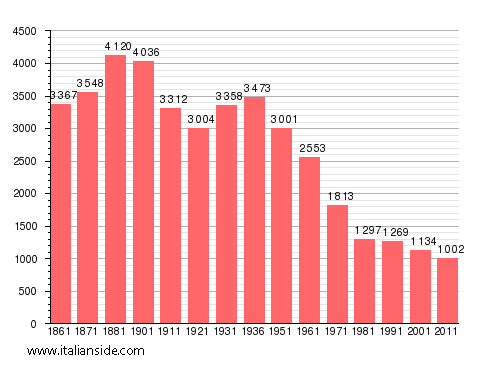 In the next picture you can see the demographic trends in Alberona from the Italian Unification (1861). It could be important to know if the last name you are investigating is a frequent surname in Alberona. As more your surname is common in Alberona, as more it could be difficult to find the right info about your ancestors in Alberona archives if you have not exact dates. If you have the opportunity to visit Alberona and Foggia province, you could plan to investigate churches’ archives by yourself (or with us! ), but from abroad is very difficult to obtain any result unless you find a reliable local help. If your research is in a dead end and you need professional help from our local Italian genealogists write to alberona@italianside.com our expert in Alberona area will study your request and will reply to you with a research plan and a quote. I am going to add to Patricia Rabunals post above. She is my sister, and I have found more info regarding the names of my Great Great Grandparents. My Grandfather was Nicola Longo born in 1889, possibly 1888 to Giovanni Longo of Alberona, born 1857 and Concetta Franchino of Alberona, Italy. Giovanni’s father was Nicola Longo, and his mother Vincenza De Finis. Nicola father was Giovanni Longo and mother,Arcangela Mauro. Concetta Franchino’s parents were Antonino Franchino and Rosa Rega. If anyone has more info, fotos or knows of any relatives of these people still living in Alberona, it would be nice to know. I am looking for information on my Grandfather Nicola Longo. Family left Italy and came to Orange NJ, he had two brothers named Anthony and Micheal. I’m looking for information on Salvatore Forgione, born around 1785 in Alberona. His wife was Donata DeSantis. Could you tell me their dates of birth, date of death and who their parents were, where they were from and their birth and death years. Thank you very much. We will be in Alberona April 19 – 21, 2018 and hope to find out where my husband’s family lived. Joseph (Giyseppe) Fandetti born March 1, 1886 and his parents Matteo Fandetti and Mary Pizzuto. Also his grandmother Carmella Suozzo born Feb. 17, 1891, parents Matteo Suozzo and Rosa. My dates and spellings may be off. Anything you have on anyone would be greatly appreciated. Thank you so much for your time. I will try again to contact you My name is John DeLuca and all the info about your husbands family is correct I am the son of Samual and all the other names match up. If you would like to start a research in Alberona please send your request to alberona@italianside.com.